Summer, a lovely time for festivals, parties or a leisurely stroll in the park. Temperature is rising so getting yourself hydrated is a must. But however refreshing these drinks may be, they will make you suffer when the time for the toilet is there. For a man there is hardly reason to panic: just find a urinal and go. 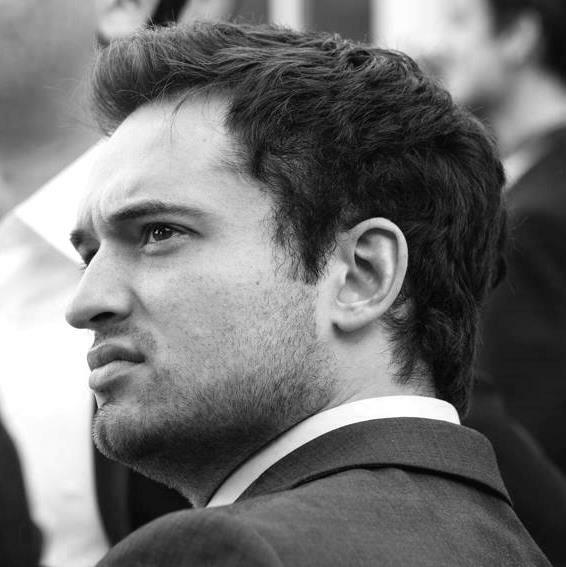 For the ladies, however, an elaborate process of tactical planning unfolds in the mind while the images of endless queues fall like snowflakes on the remains of the hopes of bringing that full bladder to quick release. A familiar scene that is all over the place. Theater halls, airports, restaurants, festivals, you name it. Although originally an American phrase, an Internet search for ‘potty parity’ results in a plethora of recorded examples from across the globe. In 2012 women in Guangzhou, China, successfully contested the unequal number of toilets by bravely occupying the men’s public toilets. Many battles however have yet to be fought out. In our home country Belgium, for instance, a judge ruled that the surplus of urinals at the Ghent festival, a ten day festival attracting over 1 million visitors of which half are women, is not deemed discriminatory. Although it’s a well-documented fact that women have to wait longer at the bathroom stall, so far the mathematical perspective seems to be lacking in literature. This is in spite of the decennia-long existence of the field of queueing theory, which has traditionally been applied most to problems of technology and decent people, rather than to such inescapable habits as the act of excreting. Nevertheless, mathematics is what you need to analyze queues because of the inherent random nature of queueing phenomena, turning simple lines of people into complex nonlinear systems with numerous parameters, whereby a small deviation can lead to excessive additional waiting. This is as opposed to good old linear systems, which see linear changes of parameters translated in proportional variations at their output. Nonlinear systems are common in everyday life and nature. A virus for example will result in a pandemic much faster if it is just slightly more infectious. And just a few extra cars make for a traffic jam appearing out of thin air. Similarly, toilet queues, or any queue for that matter, pose nonlinear problems in which the fragile balance between capacity and demand can be disrupted by subtle tweaks. A first factor explaining why women wait longer is that the net number of toilets for women is smaller than that for men. The toilet sections for men and women are often of equal size, as is the surface dedicated to each of them. What appears to be "fair" at first sight, is quite unreasonable knowing that a toilet cabin inevitably takes up more space than a urinal. Overall, an average toilet area can accommodate 20 to 30% more toilets for men (urinals + cabins) than for women. This model is an original Danish design, derived exactly 100 years by a mathematician named Erlang and ever since a gold standard in call centers for calculating how many operators are required to achieve a certain minimal delay service level. Applied to toilets, the same model allows to calculate how the average waiting time decreases as the number of available toilets increases. We allow the number of toilets to vary from 10 to 15, while the random time in between arrivals amounts to 7 seconds on average and the random time spent on the toilet to one minute on average. As the figure below shows, the average waiting time decreases rapidly as the number of toilets increases. Similarly, removing one toilet results in a drastic increase of the waiting time. 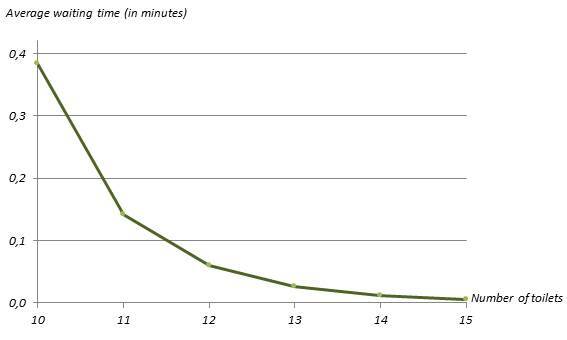 For example, when we step down from 11 to 10 toilets, a decrease of 9%, the average waiting time increases by 172%. Overall, wherever there are less toilets for women than men, as is the case where men and women get equal shares of space, women wait much longer, even if they just get a single toilet less. While the difference in number of toilets between ladies and men does contribute to the disparity in waiting times between the two, the fact that women spend more time on the toilet plays an even bigger role. According to various scientific studies women spend one and a half up to two times as long on the toilet. The reasons are mostly practical. In contrast to a urinal, a door must be opened and closed twice, a toilet seat needs cleaning, and more and more difficult clothes have to be taken off and on. 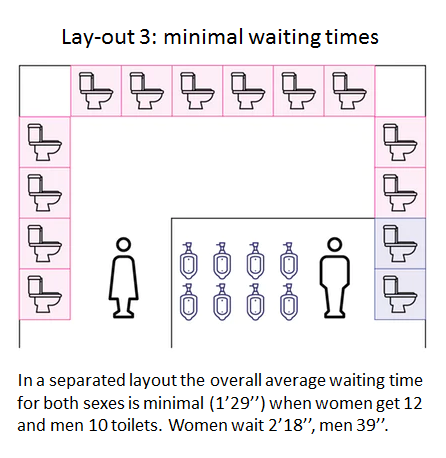 In addition to the disparity caused by the different number of toilets, the equally non-linear effect of the time spent on the toilet causes the waiting times of women and men to differ even more. Using the above formulas we can equally analyze the effect of longer time spent on the toilet, independent of the matter of number of toilets. 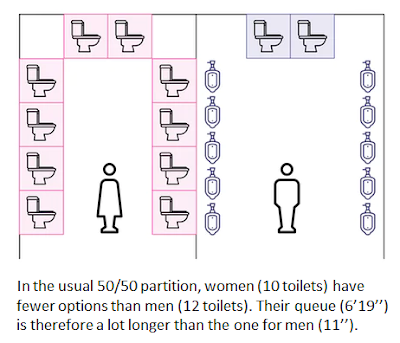 In our example we assume that both men and women have 10 toilets at their disposal and men spend an average of 1 minute in the toilet, while women on average spend 1 minute and 30 seconds. In order to keep the value of the workload for both cases below 1 (this being the condition under which the formulas can be used) we assume an average time of 10 seconds between the arrivals. 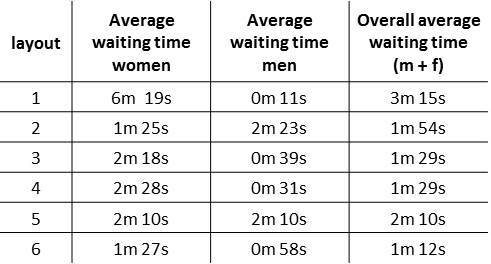 With these parameters given, women on average wait one full minute while men have an average waiting time of only 1.52 s. The impact of toilet time differences, when singled out, makes women wait about forty times longer than men. Although the figures above (doubling, times forty) seem dramatic, women usually do not have to wait excessively long if it’s not too busy. The above combinations of parameters correspond to a stable system, with the workload below 1 (ρ <1). This means that the system, with its occasional ups and downs in the waiting time, has enough capacity to process all women and men in the long run. This is as opposed to the case when the arrival intensity exceeds the capacity of the toilets (ρ≥1). At times like this, for example in between performances at festivals, or as everybody heads home, more women arrive at the toilets than the system can handle (ρ> 1) while the available capacity for men is often still more or less sufficient (ρ≈1). These conditions amplify the effects of a smaller number of toilets and a longer time spent at the toilet and result in outrageous waiting times for women. Such cases (ρ≥1) cannot be studied with the above formulas, but can be dealt with smoothly with computer simulations. We simulated 6 different but comparable and hence complementary layouts. For each, men spend 1 minute on the toilet on average, while women spend 1 minute and 30 seconds on average. Furthermore, we assume men and women arrive at random according to the same scenario in which the workload temporarily exceeds 1. At first there is a calm period of random arrivals in which there is an average of 10 seconds in between arrivals for both men and women. Next there is a busy 15-minute period during which men and women arrive every 5 seconds on average. After this period, the arrival process settles again for an average of 10 seconds in between arrivals. In layout 1 we assume a basic situation, in which women have 10 and men have 12 toilets at their disposal. The chart below shows the average waiting time for both men and women at any given time. In the calm period, the system for both men and women is stable with a workload of 0.5 and 0.9, respectively. In the busy quarter, both workloads double which makes the system unstable. As a result, the ladies’ room’s queue grows and does not stabilize. For the men, the system also becomes unstable but to a much smaller extent. Consequently, while this amounts to an increase of the average waiting time for men, this increase is not nearly as dramatical as that for women, since the queue at the men’s room accrues at a much slower pace than the queue at the ladies’ room. Once the busy period has elapsed, it takes only a short time for the men’s queue to return to a normal level. For men, as our simulation points out, the average waiting time drops to a normal level within 15 minutes. The disparity with the situation at the ladies’ room can hardly be more dramatic, as on average it takes up to 2 hours after the end of the busy period to get the waiting time below two minutes again. 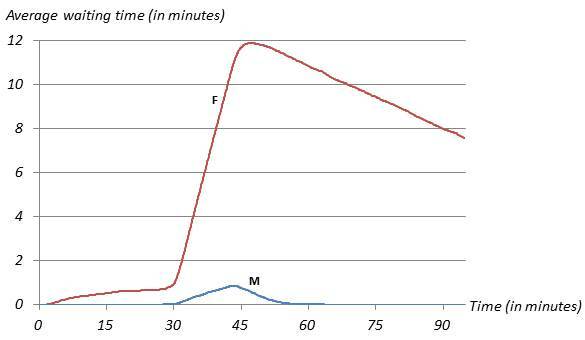 If we only take into account the women and men arriving in the first 90 minutes (the chart area), the men have an average waiting time of 11 seconds while the women wait for 6 minutes and 19 seconds on average, a massive difference. To get the women in a separated toilet layout to wait approximately as long as the men, the above scenario requires 8 additional toilets for the women. If the total area is to remain the same and only the position of the separation wall can be changed, women need 13 toilets while men need 8. This corresponds to layout 2. 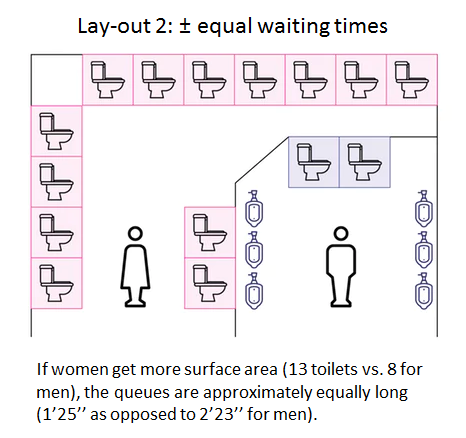 More generally, a good balance for equal waiting times in a separated toilet layout is achieved when each male toilet is matched with one and a half to up to two female toilets. In line with this rule of thumb, layout 2 achieves more or less equal waiting times. 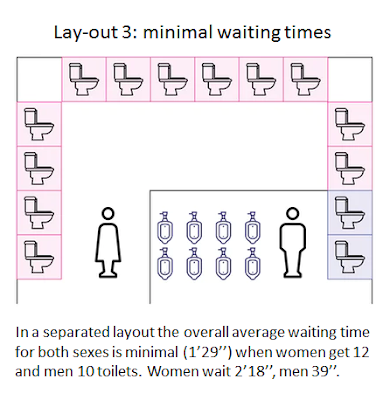 Moreover layout 2 exhibits significant lowering of the average waiting time when both genders are considered together. 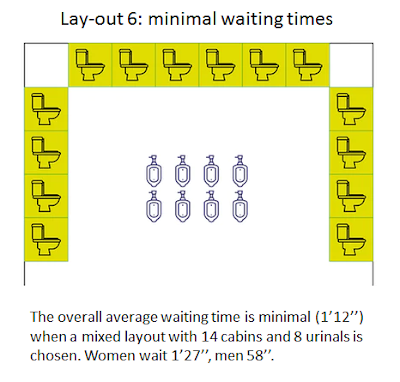 When minimizing the overall average waiting time is the primary design criterion, one obtains layout 3, with 10 male toilets and 12 female toilets. Under the condition of maintaining a separation between men and women, this layout uses the available capacity most efficiently. However, this comes at the cost of increased man-women disparity when it comes to waiting time, as opposed to the smaller disparity for layout 2. For events such as music festivals where the layout can be chosen freely, a redistribution of the available surface area between men and women according to the above guidelines is possible. However, many music festivals boast an even better solution: unisex toilets. In a mixed toilets layout, the toilet cabins are available for both sexes and optionally complemented with extra urinals for the men. As sharing the capacity is more efficient, the average waiting time decreases. 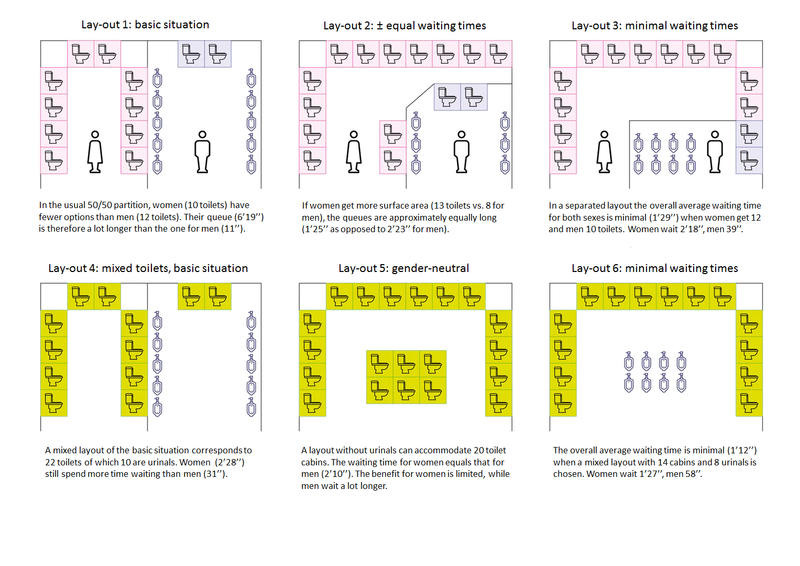 If the basic layout is retained and made accessible to both men and women (applicable to rigid existing toilet layouts as found in movie theaters, airports, etc.) we get layout 4 with an average waiting time as low as that of the most optimal separated layout (1m 29s). Because men, as opposed to women, can always choose the shortest queue (urinals or cabins), this layout does not produce equal waiting times however. The only layout guaranteeing an equal average waiting time for men and women under all circumstances is a strictly gender-neutral layout, with only toilet cabins and no urinals. In corresponding layout 5, men and women always wait in the same queue and are served in strict first-come first-served manner. Within the available area, layout 5 seats 20 toilets for men and women together. This results in an overall average waiting time of 2 minutes and 10 seconds. The available toilet surface can be used most efficiently when an ideally balanced layout of both mixed cabins and urinals is chosen. Optimally matching the number of cabins and urinals to the chosen scenario yields layout 6, with 14 cabins and 8 urinals. In this layout, men are still privileged, but to a much lesser extent than in the basic situation. Women are much better off, with waiting times of over 6 minutes in layout 1 reduced to 1 minute and 27 seconds. In addition, the average overall waiting time in this layout drops to an absolute minimum of 1 minute and 12 seconds. An overall waiting time as low as this cannot be achieved by any other layout (mixed or separated) and provides for an improvement of no less than 63% compared to the 3 minutes and 15 seconds in the basic situation. In this sense this mixed layout can therefore be considered to be both male- and female-friendly. In order to obtain such strong improvements, it is essential that toilet cabins and urinals are offered in the correct ratio, with almost twice as many cabins as urinals. If this golden ratio of two mixed toilet cabins for every urinal is not respected, average waiting times can be expected to increase again. The best way to remove the queue at the ladies’ room is thus to remove the ladies’ room altogether. Mixed toilets are just more efficient and female-friendly than separated toilets. The most efficient layout offers twice as many toilet cabins as urinals. Hereby, men are still in favor, but to a much smaller extent than often is the case now. By removing all urinals and opting for an all-cabin layout, the average waiting time for women equals that of men, and also equality toward transgenders is realized in full. If finally, the mixed use of toilets is undesirable or inadmissible, then the potential for improvement becomes significantly smaller. 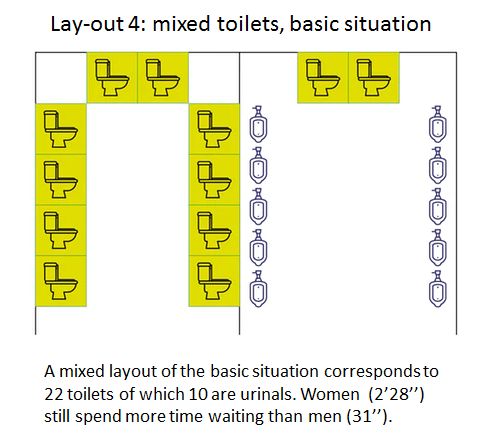 However, in a separated toilet layout, it is also possible to reduce and balance the waiting time if the layout is chosen adequately, with each male toilet matched by one and a half to up to two female toilets. Although the rights of the transgender population and people who may require assistance from someone of another gender (like people with a disability, children or the elderly) often lie at the heart of the discussion regarding gender-neutral or mixed toilets, it is clear that they may equally benefit from the overall gain in efficiency, waiting in front of toilets less. We thus contend that toilets designed according to layout 1 are overly stubborn and outdated, with improvements well within reach. If halving the waiting time may be called an improvement. Time to take a stand in this debate, tweeting #pottyparity, peeing more freely, waiting less. And, in spite of even the most heated discussion, not forgetting to hydrate. More interesting details about the methodology can be found in the technical annex. 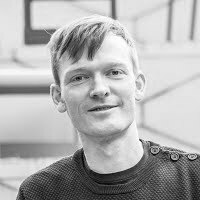 The Dutch article, published on EOS, can be found here.